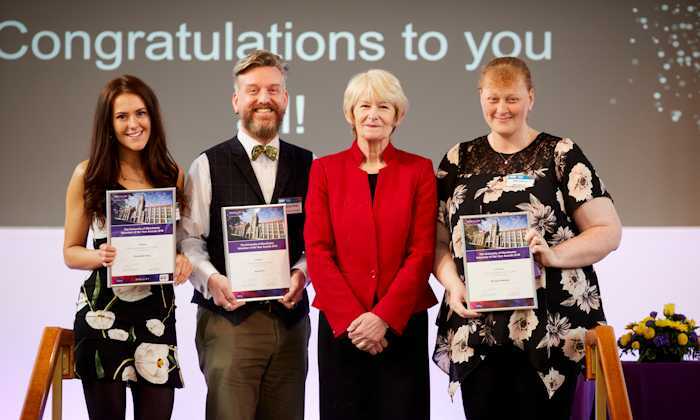 The Volunteer of the Year Awards took place in the Whitworth Hall on Tuesday, 1 May and staff, students and alumni came together to recognise extraordinary volunteering contributions across a diverse range of projects. Professor Dame Nancy Rothwell, President and Vice Chancellor, gave out the Awards. The overall winners in each category also received the University Medal for Social Responsibility, part of the suite of established President's Distinguished Achievement Awards. In 2014 Michelle set up a community outreach project aimed at reducing knife crime. Working with police forces across the UK, the community-led anti knife initiative created the opportunity for local knife surrender campaigns, leading to over 100,000 knives being removed from our communities. The knives were used to create a knife angel sculpture to create a permanent reminder of those who have been injured or lost their life due to a knife. Alongside the campaign Michelle has worked with young people affected by knife crime, creating educational drama and tools to help others understand the dangers and consequences of knife crime. These young people have become anti-knife ambassadors, attending events locally and nationally to raise the profile of the work. Michelle takes on numerous other roles including running a foodbank and supporting families through education hearings. Charlotte is the President of Manchester Outreach Medics (MOMs). This student society supports young people from deprived backgrounds to get the knowledge and skills required to apply successfully for medical school. Many sixth form pupils applying for medical school will pay significant amounts of money to go on courses to give them the best chance of success. MOMs provides a similar service for free through a range of events which gives the pupils an insight into medicine as well as the knowledge needed to write a strong application form. Furthermore Charlotte has developed new branches of the service, which gives students one to one mentoring through their application. The work of MOMS is readdressing the imbalance in medicine, which in turn will in the future help to improve the healthcare of deprived areas as doctors with backgrounds in these areas are more likely to then practice medicine there. Sean gives his time and expertise to develop and provide voice and communication workshops to the trans and non-binary community, in partnership with the LGBT Foundation. He has trained student volunteers who are studying speech and language therapy to support him in this role. The workshops allow participants to start on a journey of changing their voice safely to more closely match their gender identity. This service is very hard to access via the NHS and very expensive if undertaken privately, meaning many people cannot access such services. Trans and non-binary people are at greater risk of mental health difficulties than the population as a whole and the workshops have shown to increase the confidence and self-esteem of participants, as it allows participants to achieve the gender perception of their voice that matches their identity, therefore helping them live a more authentic life. The awards also saw the inaugural Social Justice Photography Competition Grand Prize awarded to Julia Stankiewicz from the School of Mechanical, Aerospace and Civil Engineering for her photo Invisible.